The challenges of mental illness were a central concern for Marjorie Clark and they are a continuing passion of her husband Hugh. “Ignorance about mental illness and the stigma surrounding it are still real problems,” says Hugh. 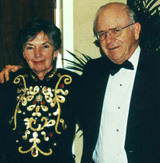 The Clark family has supported various mental health organizations financially in Hamilton for many years, and both Hugh and Marge were committed volunteers with the Family Association for the Hamilton Program for Schizophrenia. Established after Marge’s death in 2007, the Marjorie Hawkins Clark Fund will focus on community support for people with mental health issues. Initially, it will target two critical areas: employment and peer support. As he pondered the best way to direct the fund, Hugh sought help from Hamilton Community Foundation, with which he has had a long affiliation. The Foundation, in turn, reached out to experts in the mental health field. Together, they matched best practices with Hugh’s goals and refined the focus of the fund. Marjorie Dell grew up in Hamilton’s North End, the youngest of eight children. Her father died when she was just four years old. The extended Dell family is a close one, and organizing annual family reunions was one of Marge’s delights. Marge herself lost her husband at a young age and raised two sons, Bob and Ted, on her own. She and Hugh married in 1988. Hugh has three children.